Summary : This is an excellent cinnamon flavored black tea and, just like the name suggests, is an excellent tea to drink during the Christmas holiday period. Review : With the Christmas holiday fast approaching, I thought it was time to finally break open one of the flavored black teas I recently ordered from Adagio Teas called, simply enough, Christmas. Here is how Adagio Teas describes this tea on their website : "The tea to get you into the holiday spirit! This blend of bright, tangy Ceylon black tea flavored with warm cinnamon, pungent cloves, and orange peels is a Christmas delight. Spicy and fresh aroma, outdoorsy and cozy, with a balanced tangy flavor and slightly sweet finish. Perfect to sip while decking the halls, being jolly, or dreaming of a white Christmas." The Christmas flavored black tea from Adagio Teas contains the following ingredients : black tea, cinnamon bark, orange peels, natural spice flavor, cardamom pods, cloves, ginger root, natural ginger flavor and natural cinnamon flavor. Now, despite the description of the tea, make no mistake about it - the Christmas tea is a cinnamon tea. As soon as I ripped open the package I was greeted with a very strong scent of cinnamon and an overall spicy aroma. Yet, the description provided by Adagio Teas does not lie, either - as the fragrance of the tea really does remind me of Christmas. The taste of the tea didn't disappoint, either. 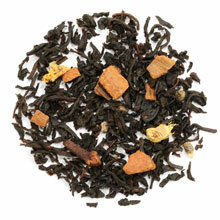 The flavor of the cinnamon really jumps out in this tea, with orange and ginger flavors lingering in the background. But at the end of the day, this tea is an excellent cinnamon flavored black tea. One surprising thing about this tea, considering the ingredients found in it, is the lack of spiciness. Personally, I found this a good thing. However, if you are looking for a spicy cinnamon tea, then you'll need to continue your search as I found little if any "spiciness" in the teas flavor. Another big positive of this teas flavor is the near absence of the traditional powerful black tea taste. All too frequently, I've sampled various flavored black teas that have "no flavor" beyond the traditional black tea taste. Bluntly, the powerful taste of traditional black tea simply overwhelmed whatever infusions had been added to the tea. Happily, that is not the case in this tea. For all intents and purposes, the powerful taste found in Ceylon black tea is completely absent in the Christmas tea from Adagio Teas. And that absence of traditional black tea flavor, beyond allowing the infusions added to the tea to leap to the forefront, also has another benefit - the tea is absolutely smooth without a hint of bitterness (or "astringency", as some people like to say in politically correct terms). Indeed, the Christmas tea from Adagio Teas sort of defines the word "smooth" when it comes to black tea. In short, if you are worried about swallowing bitterness with this tea - don't - as you won't get any. Which is a very good thing indeed! Overall, this is an excellent flavored black tea. The Christmas tea from Adagio really is an ideal tea to serve around the Christmas holiday. And for those longing for Christmas in June, this tea just might help satisfy that holiday craving as the "mood" of this tea is all about Christmas. Recommendation : Yes. If you love cinnamon, you'll love this tea. And both the teas fragrance and taste very much help set a "Christmas" mood, for lack of a better word to describe it. Moreover, the tea lacks any sort of bitterness nor does the tea have any of the traditional black tea flavor found in so many other flavored black teas. Finally, this tea really is a great "introductory" black tea to someone who has never tried black tea before. Brewing Instructions : Place 1 teaspoon of loose leaf tea in an infuser. Boil 1 cup (8 ounces) of water. Pour water over the tea and wait 3 minutes. Threes minutes was used for this review. Impra Raspberry Flavored Black Tea : An absolutely terrible flavored black tea that is bitter and has no flavor of raspberry whatsoever. Adagio Teas Gingerbread Flavored Black Tea : If you love gingerbread, then this tea has your name on it.